Want to know whether a user has read one of your company’s most important documents? Well, SharePoint does not have an inbuilt feature, but Collaboris have developed a product that can and it’s known as DocRead for SharePoint. DocRead makes it easy to distribute and track key documents such as policies (e.g. “Health and Safety Policy”) and project documents such (e.g. “Change Request”). DocRead for SharePoint is classified as policy management software for SharePoint. If you have documents like office documents, videos, images or PDF’s and you want to track who has acknowledged those documents (or not), then DocRead makes it very easy. 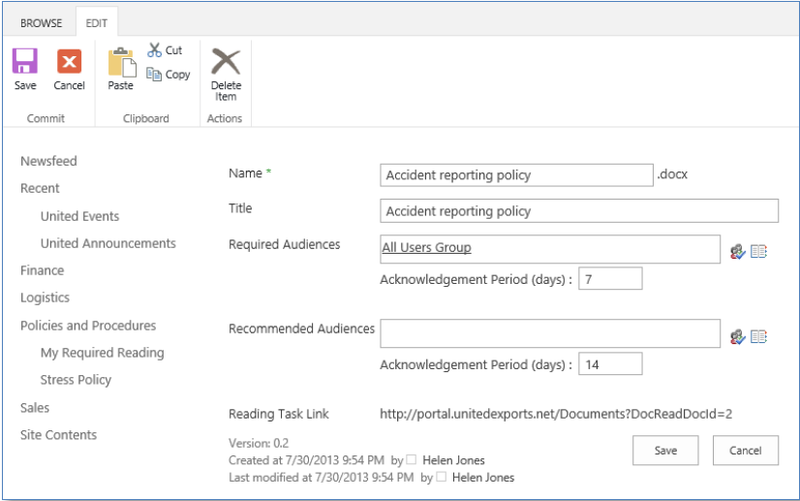 Any policy or procedure that can be saved into a SharePoint document library can be assigned to a specific group of users. Once assigned DocRead will take care of tracking it via its inbuilt reporting. DocRead also works with custom lists and the out of the box lists, so can be used with the “Announcements List”, for example. Collaboris have also developed DocSurvey, which is a customized SharePoint Survey that allows you set quizzes with pass rates. DocSurvey can be used in conjunction with DocRead at the time of confirmation. As the user attempts to confirm they have read the document/list item they can then be forced to pass a test. This ensures that the user understood the contents of the document. DocRead can be installed on all operating system supported by SharePoint Foundation or above. You can download from this URL. 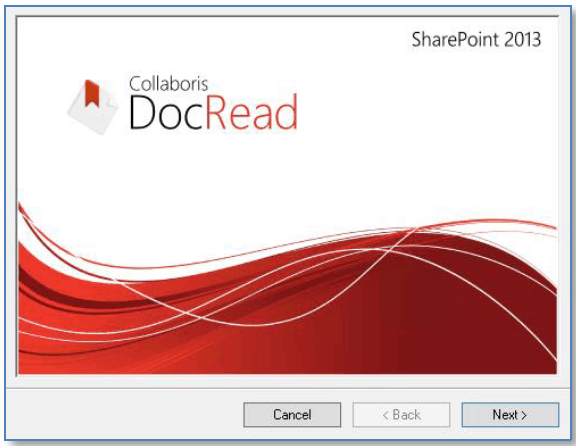 DocRead supports both SharePoint 2013 and SharePoint 2010. 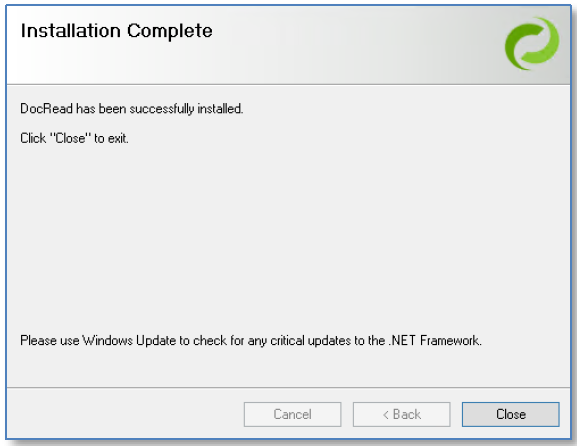 Once downloaded you can install the product through a standard windows installer, and once clicked on the setup file (Run as administrator) the installer windows will open as shown below. Very easy steps to install. But one thing to note is if you select the installer to deploy the solution to SharePoint then the IIS App Pool will be restarted in the web front-end server which will make your SharePoint site unavailable for a few seconds. You can also choose to manually deploy the solution through Central Administration at a later time. During installation, if you have not selected “Deploy solution to SharePoint” then once the installation is complete, open SharePoint 2013 Central Administration and then go to System Setting. Then click on Manage farm solution from the Farm Management section. Then click on the “Collaboris” WSP solutions and then click on deploy solution. Once installed, we need to configure DocRead in the SharePoint farm from Central Administration. Open SharePoint Central Administration and you will see “Collaboris Settings” section in the Central Administration home page. Main DocRead database: It stores all the information required to assign and process tasks. Scheduler database: It stores scheduling information used by the scheduler service to send notification emails. Click on the Database settings and fill the details like a Database server, Database name, account name etc. which will create the databases. We need to attach the Web Application that contains the sites where you wish to enable DocRead. You can attach from the Global settings link under Collaboris Settings in SharePoint Central Administration. 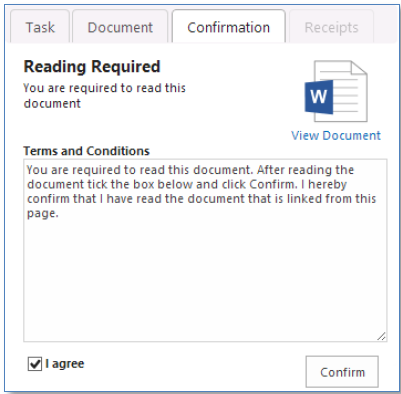 DocRead provides an option to configure the messages that will be displayed to users for each step of the document approval process like the message shown to the user when the user finishes reading the document etc. You can activate DocRead by putting the key in the Licensing link from the configuration section under the Collaboris Setting in Central Administration. I also checked with Collaboris about adding more user licenses and it’s just a case of pasting a new license key that they will send. DocRead reporting allows a DocRead Administrator to download the report in Excel, PDF as well as view the reports on the screen. To activate the report we need to activate Collaboris Reporting Infrastructure which is presented under Manage web application features under the particular web application. The Required Audiences are the users who will read a document from the document library. ‘Acknowledgement Period’ is how many days you want to give the user to complete reading the document. Different task icons: DocRead uses different icons for the current status of the reading tasks. Email Notification: One of the most useful features of DocRead is to alert users with Email notifications. It alerts when new assignments have been created or any existing tasks are completed. The email also contains specific information about the task. Emails are configurable and customizable. You can also disable the email if preferred. They can, therefore, be customized according to the requirement for your organization. – Assigned Email: The assigned email is sent when a user has been assigned new reading tasks by a DocRead Publisher. It contains instructions and links to the document which the user can follow to complete the task. – Confirmed Email: This email is sent when a user has used DocRead to confirm that they have completed the task and contains a link to the reading receipt. – Overdue Email: This email is sent when a user has not completed their required reading within the time allotted by a DocRead publisher. DocRead provides various options to review documents for the user. DocRead will send a link in an email notification from where end user can review the document. Also, the end user can review a document by clicking on the reading task in a DocRead web part. Also, an end user can review a document by clicking on the Reading Requirements tab from the Ribbon from the single document library. Tasks are completed by checking the box to accept the Terms and Conditions and then clicking the “Confirm” button. DocRead provides options to view the progress of Reading tasks. A suite of reports will display the number of completed and outstanding reading tasks and provide options to drill down into further detail. It also allows administrators to download the report in the form of pdf, excel or csv etc. Smart Move refers to the technology that detects when a user joins or leaves a group or audience. DocRead is able to utilize Smart Move to ensure that your users only ever receive the correct reading tasks. This means that if a new user joins the company (and is placed into groups that have been assigned tasks), DocRead will automatically send them the required reading for those groups. This is ideal for new starter documentation, or for project work. Although DocRead solves a very simple but common business process, it offers a lot of power. I especially like the SmartMove feature that makes it easy to automatically assign required / mandatory reading to people who get put into AD groups or SharePoint Groups. I can see that many organizations who would want DocRead would also have a need to use DocSurvey to ensure users understood what they are reading! Overall this is a very useful tool to track whether documents have been read by a user or not. You can check out more on the Collaboris Site. Previous Article How to cancel all workflows having Suspended state in SharePoint 2013?